Because we don’t own a boat yet, and we haven’t found a renter for our house, my motivation to downsize has been slim. I don’t even know how to sail yet. So, I wonder at what point do we put a stake in the ground and announce our lifestyle is going to change. Exactly. Right now. My husband has already made promising steps towards our sailing goals as he’s on training in Barbados and Antigua at the moment, and today he spent the day aboard a Leopard 47. But, for me, it’s hard to live like a cruiser, when I’m not actually a sailor yet. So I have been at a crossroads. For example, do I give away my Mason jars? Who knows? Maybe I’ll still be in Ottawa during strawberry season. And, what about our hot tub. Should I drain it and winterize? Bit late for that. And, so I keep adding chemicals and monitoring pH levels. Today, a water leak in our basement forced me to unpack some of the boxes that we’ve been storing in our basement for almost a year. While airing things out to dry, my basement started to take on the appearance of an ailing thrift store. 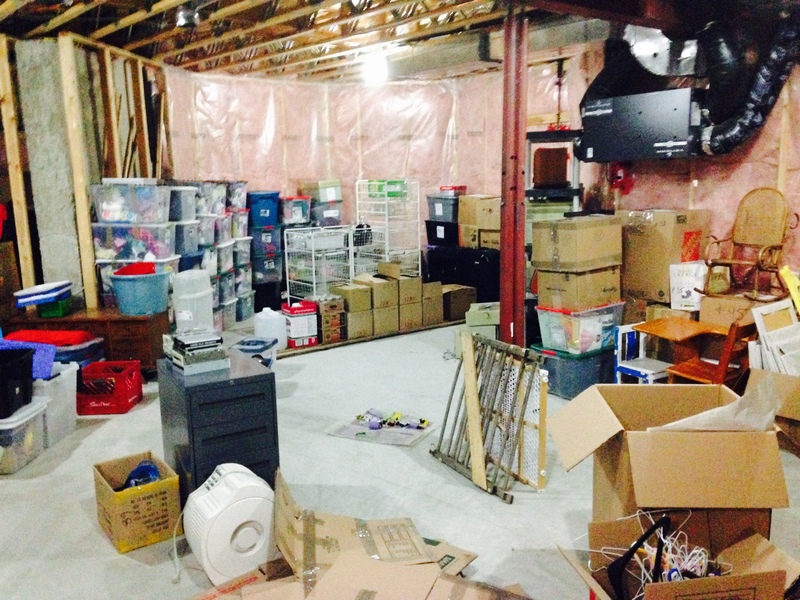 Basement storage: can I interest you in something? Our family has about 220 boxes packed away in our basement. We packed our belongings when we thought we might move to California, last summer. I’d love to downsize to ten percent of what we currently own, and re-home the other ninety percent of our belongings. I used to be able to fit all my belongings in a single van load. What happened? Fortunately, our water leak was detected and fixed early. Only about five boxes were affected. But, I refuse to re-pack. Instead, I vow to give away, sell or throw out belongings that are no use to me. I can’t procrastinate. It will have to be done this evening. I can’t have wet items going mouldy in the basement. And, after that, I am going to boldly pitch a $15 bath mat. I like it. We use it. But, I can live without it. The mat is thick cotton and it is way too much trouble to clean. It kicks and fights with my washing machine. It becomes so saturated that I can’t dry it without putting it outside. So, out it will go. Tonight. I don’t even need excuses. We will continue to be ruthless, especially as we procrastinate further and need to get rid of our things. But, some items we will keep for sentimental reasons. We have an antique piano, for example. It belonged to my husband’s grandmother. The inscription on the back says it was transported 10 miles by horses in 1913. 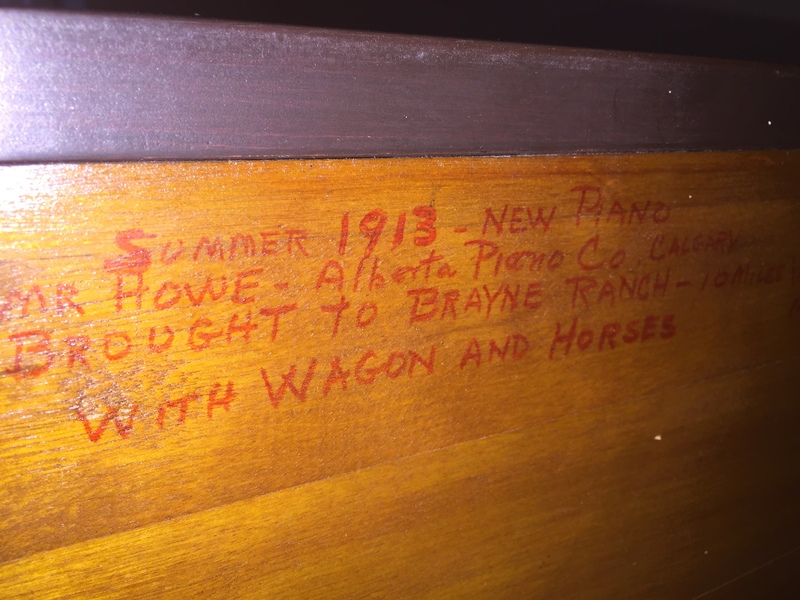 Inscription on our upright piano. For now, the china will be curated with family or put in box 221. Or, maybe box 22, depending on how successful we are at downsizing. Based on our summertime adventure – where we slept in a tent for 60 days – we already know that we might hold onto lots, but we actually need very little. Loving the blog so far! We recently downsized from a 3000 sq ft house to a 38ft Motorhome. 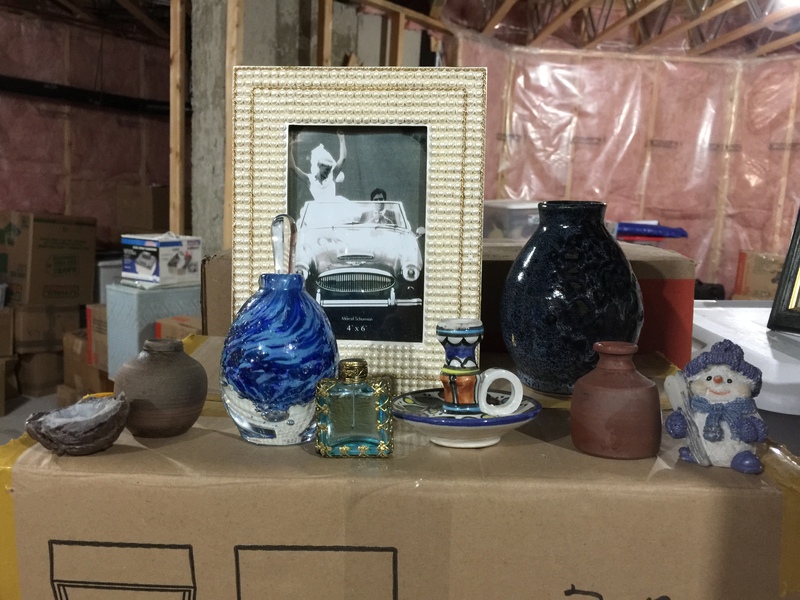 We have one storage unit with stuff in it… but we’ve lived this long (3 months) without it: do we really need it?